NOW IN ITS TWENTY-EIGHTH SEASON, the Kandinsky Trio continues one of this country’s most enduring chamber music residencies at historic Roanoke College with over a thousand concerts of high caliber chamber music in the U. S., Europe, and Canada, including New York (Miller Theater and Merkin Hall), Washington (The Kennedy Center), Atlanta (Spivey Hall), Oklahoma City, Tampa (Tampa Bay Performing Arts Center), Portland, Boise, Austin, Charleston, San Francisco, Banff, Bratislava, Budapest, Vienna, and Zagreb. The Kandinsky Trio has also been heard at such venues as the Interlochen Festival, the Concert Society at Maryland, the Tennessee Performing Arts Center in Nashville, Cincinnati’s Aronoff Center, and the Center for the Arts at Penn State. Its recordings are aired regularly on Boston’s WGBH, Chicago’s WFMT, and the Maine, Georgia, Nevada, Wisconsin, and Minnesota Public Radio Networks. Live performances have been broadcast on the MacNeil/ Lehrer News Hour, numerous times on National Public Radio’s Performance Today, and WNYC’s Around New York. Their CD, In Foreign Lands (Brioso), released in 2003, was selected by WNED (Buffalo and Toronto) as one of the best CDs of the year, and London’s Music and Vision dubbed it “one of the year’s best chamber music recordings.” The Charleston Post and Courier named the Kandinskys “a trio of stunning talent” after their appearance on the 2008 Spotlight Series at Piccolo Spoleto. 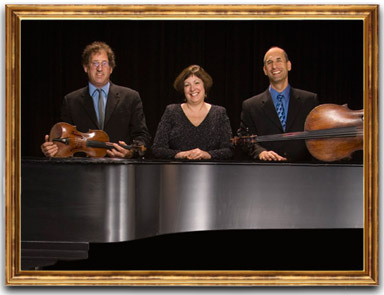 Described as “spirited and persuasive,” American Record Guide, and “virtuosity, with spine-tingling precision,” Cincinnati Enquirer, the Trio draws in new audiences with both its passionate performances of masterworks and innovative ideas in re-defining chamber music. The Trio is one of only six piano trios ever to win the prestigious Chamber Music America Residency Award. In 1999, the Kandinsky Trio was chosen by Senator Charles Robb as the representative of the Commonwealth of Virginia at Kennedy Center’s State Days series. In addition the ensemble has received multiple awards from the Theodore Presser and Carpenter foundations to extend its artistry and visionary residency ideas to under-served communities. The Kandinsky Trio regularly collaborates with such diverse artists as bassist James VanDemark, violinist/violist Ida Kavafian, cellist Steven Doane, soprano Dawn Upshaw, composer Gunther Schuller, storyteller Connie Regan-Blake, and jazz legend Larry Coryell. Their innovative projects have included Mike Reid’s Tales of Appalachia for Trio and storyteller, John D’earth’s Natural Bridge, for Trio, jazz bass and guitar with jazz great Kurt Rosenwinkel, and a unique collaboration with storyteller/whistler Andy Offutt Irwin which features creative arrangements of jazz standards and folk music to produce a totally original musical experience. In March 2010 the NEA recognized the Kandinsky Trio’s achievement with an “American Masterpieces” grant to tour and record the jazz-influenced chamber music of Gunther Schuller and John D’earth. On Light Wings, OmniTone #15219, was released in October 2013.